You are here: Home > Blog > Energy, sustainability & economics > The mediterranean cypress and forest fires. According the United Nations FAO, some two million hectares of forest were burnt in the Mediterranean region, between 2006 and 2010. Most of these fires were 'human induced'; they (the fires) are the most frequent cause of degradation / loss of forest / woodland in this region. In 2012, a fire swept through some 20,000 hectares of forest near Andilla (Valencia). After the fire, it was found that though oaks, holm oaks, pines and junipers had been completely burnt, the vast majority (98% +) of the Mediterranean Cypresses were still standing, tall and green. There followed a three year study of the fire resilience of the Mediterranean Cypress (Cupressus sempervirens var horizontalis) to see if stands of these trees might function as buffer zones to hinder or prevent the spread of forest fires. Various laboratory investigations were set in motion that examined not just the flammability of dead and dry samples of the tree, but also the characteristics of the living twigs and leaves. These revealed various key features of the cypress - such as the high water content of the leaves, even when it is hot and living under drought conditions. The leaves have a thick, waxy cuticle that restricts (cuticular) water loss / transpiration; the stomates (pores on the underside of the leaf) are arranged so the stomatal transpiration / water loss is reduced to a minimum. When the leaves are shed and fall to the forest floor, a thick, dense layer of decaying material forms. 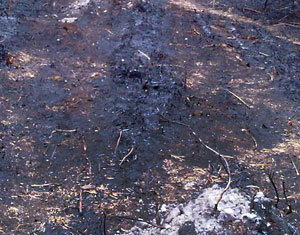 This layer acts as a ‘sponge’ that retains water - this also helps reduce the spread of fire. Another important feature of the leaves is the way in which they release biogenic VOC’s - volatile organic compounds (often terpenes , from resins) - see also the woodlands' blog on pine trees and VOC's. Trees such as pines readily release VOC’s, which can contribute to the combustion of leaves, twigs and even trees.